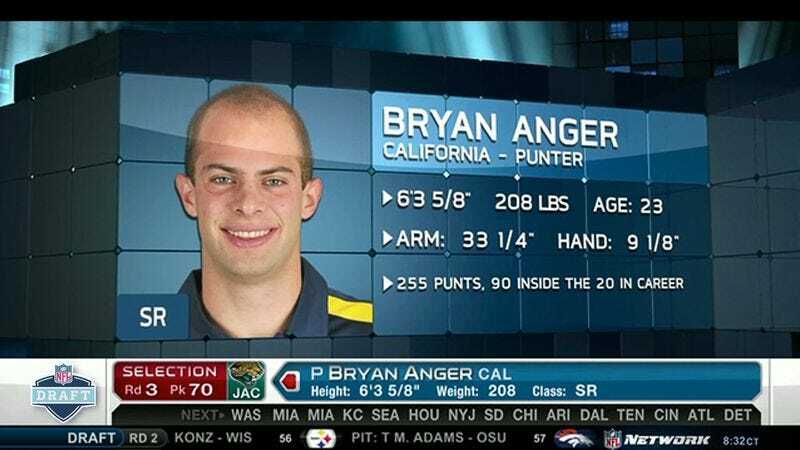 NEW YORK—Mere moments after becoming the highest-selected punter in the NFL Draft since 1995, Bryan Anger took the opportunity to thank the Jaguars and announce that he would do all he could to help punt the team to greatness. "This is, without a doubt, the greatest moment of my life—and, I promise you, a defining moment in Jaguars history," Anger told reporters during a press conference after the decision Friday. "This is the year they punt themselves into the spotlight. I will do everything I can to make sure the Jaguars and punting will soon be seen as one and the same." Anger also promised fans that, as their punter—and therefore the leader of the punt team—he would be the very model of a Jacksonville Jaguar, adding that they should "get used to me, because they're going to be hearing the name Bryan Anger all the time in years to come." "It's every young punter's dream to make it to the NFL and punt the ball away at the elite level," Anger said. "I think Jacksonville gives me by far the best chance to do that." The 6-foot-4, 208-pound Anger, a controversial choice for Jacksonville at No. 70 overall, had a distinguished career at the University of California, where he was twice a semifinalist for the Ray Guy Award, the little-known trophy given to the nation's best college punter. Dismissing the idea that he might experience difficulties handling the transition to the second-worst punting team in the NFL, Anger pointed out that analysts and experts said Jacksonville was exactly the sort of team most likely to take a punter with an early-round draft pick, and also by far the best team for a young, aggressive punter wanting to punt as often as possible. "As a punter, you look at this team and you know you're going to be getting a lot of playing time," Anger said. "Which is fine with me. I look at all the teams that passed on me, and the only thought I have is 'Just you wait, guys. I'll be punting to all of you soon enough.' Mark my words, there are 31 NFL franchises out there who are going to be seeing a lot of me." Coach Mike Mularkey was quick to welcome his new player to the team, saying Anger was going to be "Jacksonville's punter of the future and, in many ways, the centerpiece of our team." The Jaguars franchise, meanwhile, seemed to be just as excited about Anger, releasing two previous punters, Nick Harris and Spencer Lanning, the day after the draft. "You look at how a lot of teams these days are built around a high-powered passing game, and you look at [Jaguars quarterback Blaine] Gabbert, and you realize how important it is for us to have a great punter in our arsenal," Mularkey said. "After all, we punted third-most of any team in the league last year, so it's about time we started getting good at it. In fact, at this point, we may as well just resign ourselves to building our entire team concept around the idea of pinning other teams deep with a really good punt." "I'm not saying this team is automatically going to be a Super Bowl contender just because I'm punting," Anger said when told of Mularkey's comments. "All I'm saying is, if it does come to that—Super Bowl, fourth quarter, clock winding down, Lombardi trophy on the line—at that moment, I want to be the punter the Jaguars turn to."